Posted in Uncategorized and tagged cats and mice, cats and mice block, farmer's wife, farmer’s wife quilt, quilt, quilt block. Bookmark the permalink. 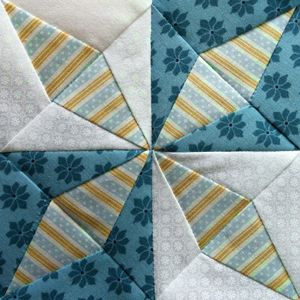 I’ve always wondered about this block since the first time I flicked through Laurie Hird’s book and set eyes on it. I think I may safely say that this is the block I looked at and thought about longest. What do I see in this pattern? Why is the basic idea symmetrical but then not followed throughout? Where is the hidden logic behind the arrangement of colours? Is it only to be found when joining several of these blocks? Thus creating stars like in Periwinkle? But even that is not true. So where is the sense? Frankly: It completely eludes me. The block’s name might certainly refer to the second World’s Fair held in Chicago in 1934/35. But this brings no light to the odd appearance of this block. And since I couldn’t make out any sense in the fabric arrangement I simply refused to follow it. 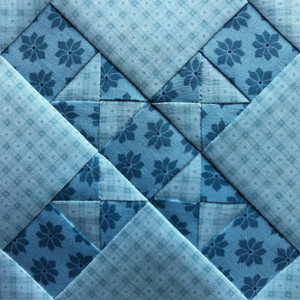 I saw many examples on the web of quilters who followed the pattern, but I saw as well many who didn’t. When playing with the fabrics I realised that there are many different ways to arrange them, each time ending up with a completely different block. Amazing! I finally settled on this design, very clear and “modern”, I fancy, and thus almost the entire opposite of Laurie’s makeup. Posted in Uncategorized and tagged century of progress, century of progress block, farmer's wife, farmer’s wife quilt, quilt, quilt block. Bookmark the permalink.